Truffles are one of life's simple pleasures. One its chocolate so you can't really go wrong there, then its intensely flavored and just melts in you mouth. Yes, truffles are one my favorite ways to eat chocolate. So for my Father's birthday party I decided to make a trio of truffles as my contribution to the party. They were the perfect dessert for me because they could be made in advance and I knew that I was going to have a hellish week ahead of me. So I made the base for 2 of the truffles on Thursday and the last on Friday. I rolled them all on Saturday and went to the party. And they couldn't have gone over better. The Mexican chocolate ones went over the best but I will warn you they do not get as firm as the other truffles so you might need to put them in the fridge to firm up every few hours. Please do not feel daunted by truffles at all you can make them, and people will be impressed. Just be careful they can be very addicting and I think I had 4 before I was finished rolling them all, for quality assurance purposes of course! 3 Truffles - The ingredients change but the process is still the same. Heat cream or coconut milk and butter in a saucepan until it comes to a roiling boil. Remove the liquid from the heat and pour over the chocolate in a bowl and allow the chocolate to melt until smooth. Add in liqueur if needed and spread mixture out on a parchment lined pan or in a bowl. Leave in a cool place uncovered for 24 hours in the fridge for up to an hour. To make the truffles, pull off a quarter size piece from the tray or bowl and roll into a bowl. Please use latex gloves they will make this process so much easier, I promise. 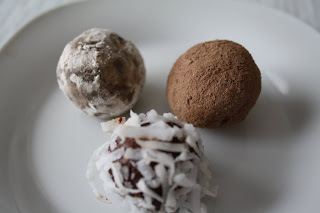 And coat with topping, the Raspberry was coated with cocoa powder, the Mexican chocolate was coated with a combination of powdered sugar and cinnamon, and the coconut was coated with coconut flakes. I think I would love all 3 but I bet my favorite would be the coconut! YUMM! These look so delicious! I just love making truffles at home, it's such an impressive treat. I have yet to make truffles! what in the world am I waiting for???? As if one great truffle wasn't enough! Well done!! 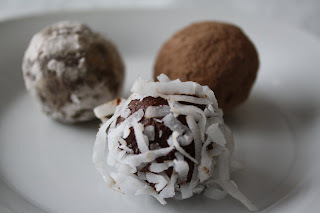 Truffles are truly the perfect chocolate treat, and I love the variations you did. I hope your dad had a wonderful bday--and I know that dessert was a huge hit! I love all 3 of them!!! MMMM.... I want 3 of them with my morning coffee!!! i'd eat 'em in this order: coconut, then mexican, then raspberry. i won't discriminate though--i'd equal amounts of all of them. Pearl - go right ahead I would love to be on your blog roll! I love truffles and usually make them as decoration for the base of my triple layer fudge cake. Beautiful and delicious. Ha, quality check, like it! LOL! DeelishDish - what a great way to use them. But I think I would pick them over cake!